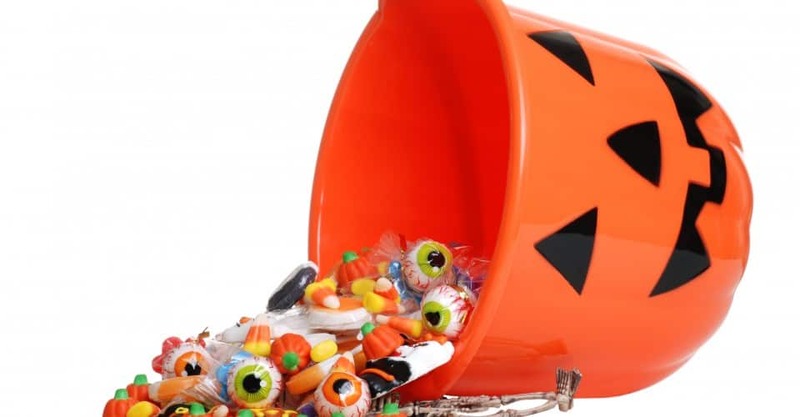 #Halloween Candy Deconstructed – Forget the #Calories. Do You Know What You’re Actually Eating? Candy Corn: This very popular Halloween candy has been around for more than 100 years, according to the National Confectioners Association. Aside from each piece costing 7.5 calories, I have to say that I was surprised by some of the ingredients — not exactly what I expected. Corn Syrup. Another name for liquid sugar. According to the Center for Science in the Public Interest’s (CSPI) Chemical Cuisine ( www.cspinet.org/reports/chemcuisine.htm), corn syrup, which consists mostly of dextrose, is a sweet, thick liquid made by treating cornstarch with acids or enzymes. Corn syrup has no nutritional value. Confectioner’s Glaze. According to Luke LaBorde, Ph.D., a professor of food science and Penn State University, “It contains lac resin which is a secretion made by a certain beetle in Asia. Much like honey from bees, it is the product made by the insect that is collected and not the insect itself.” Basically this is a food grade shellac and what creates the candy’s hard coating. Honey. A sweetener that helps with blood sugar control. Dextrose. Dextrose, more often called glucose, is a type of sugar that is not very sweet. Gelatin. This is the same thing used to make JELL-O. It’s a protein acquired from animal hides and bones. Titanium Dioxide. A food coloring that, according to Labelwatch.org, is generally safe. It creates a transparency in the food. Yellow 6. According to CSPI: Industry-sponsored animal tests indicated that this dye, the third most widely used, causes tumors of the adrenal gland and kidney. In addition, small amounts of several carcinogens, such as 4-aminobiphenyl and benzidine (or chemicals that the body converts to those substances), contaminate Yellow 6. However, the FDA reviewed those data and found reasons to conclude that Yellow 6 does not pose a significant cancer risk to humans. Yellow 6 may cause occasional, but sometimes severe, hypersensitivity reactions. Yellow 5. “The second-most-widely used coloring causes allergy-like hypersensitivity reactions, primarily in aspirin-sensitive persons, and triggers hyperactivity in some children. It may be contaminated with such cancer-causing substances as benzidine and 4-aminobiphenyl (or chemicals that the body converts to those substances),” according to CSPI’s Chemical Cuisine. Red 3. The evidence that this dye caused thyroid tumors in rats is “convincing,” according to a 1983 review committee report requested by FDA. FDA’s recommendation that the dye be banned was overruled by pressure from elsewhere in the Reagan administration. Red 3 was formerly used to color maraschino cherries, but it has been replaced there by the less controversial Red 40 dye. It is still used in a smattering of foods ranging from cake icing to fruit roll-ups to chewing gum. Sesame Oil. An oil that is high in vitamin E.
The Tootsie Roll is a national candy treasure, and if you or your children go trick or treating you’re more than likely to end up with one of these in your pile of goodies. Partially Hydrogenated Soybean Oil. Creates trans fat, which increases heart disease. Condensed Skim Milk. Milk from which the liquid has been removed and to which, typically, sugar has been added. Cocoa. A powder made by roasting and grinding cocoa beans and removing the cocoa butter. This is safe to eat and is actually the heart-healthy component of chocolate. Whey. The watery substance that separates from the solids (the curd) in milk. Soya Lecithin. Soy comes from the soy bean. Lecithin is an emulsifier. products thereof.” Natural flavors, on the other hand, are derived from natural sources. Looking to avoid candy altogether on Halloween? Good news: According to research done at Yale University and reported in the Journal of Nutrition Education and Behavior, children are just as likely to choose toys as candy on Halloween. For the study, seven households offered 284 trick or treaters between the ages of 3 and 14 a choice between comparably sized toys and candies. The results showed that the children were just as likely to choose the toys as the candy. How about bubbles, Play-Dough, Silly Putty? It might be worth a try, although it might cost a bit more — at the very least you’ll be promoting good health.